Well I hope everyone's Thanksgiving was what they had wanted. I also hope the turkey is now digested and your NFL team performed admirably. Today is Black Friday and some are thrilled beyond words and I am one of them, for I will be alongside a stream in a special mall where there will be no lines and no angry words. This will likely be my last post for a few days. My son and I will be heading out early Sunday morning for Pennsylvania for our annual deer hunt. It's a tradition we have enjoyed for almost 30 years. With some luck we will be successful in the harvest of a whitetail, and if not success will be still enjoyed just by spending time in a natural setting for a few days together. The first salter stream to benefit from the success of the Quashnet work was Red Brook, a historic sea-run brook trout stream flowing through the towns of Plymouth, Wareham and Bourne before emptying into the saltwater of Buttermilk Bay. 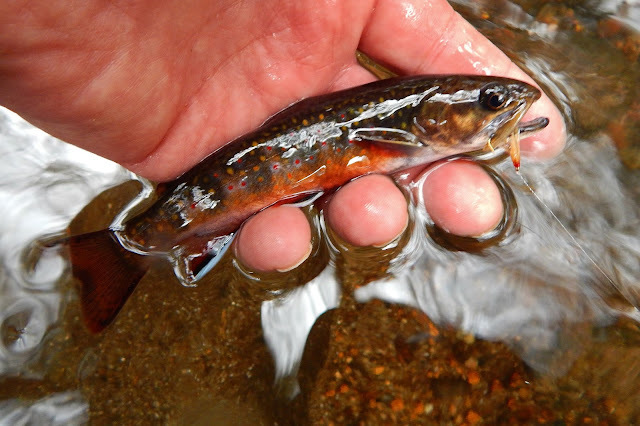 The salter brook trout of Red Brook owe their survival to several generations of the Lyman family who acquired 638 acres along Red Brook and then—inspired by the success of the TU work on the Quashnet—deeded their stream over to a management partnership formed by TU, The Trustees of Reservations, and the Mass. Div. of Fisheries and Wildlife. 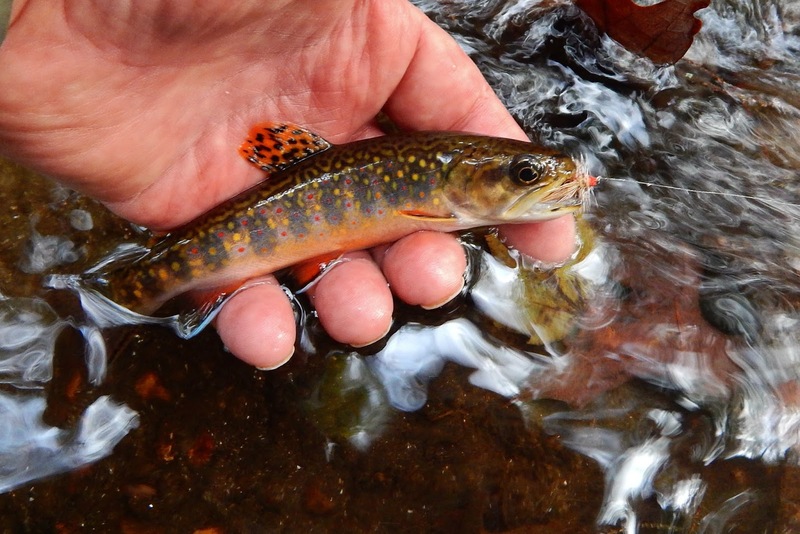 After thousands of hours of TU grassroots volunteer labor to restore habit and raise funds, and the removal of four dams by a broad coalition of state and federal agencies and private donors, along with TU and other nonprofits, Red Brook’s salter brook trout are thriving once more. In fact, Red Brook’s salters are doing so well that they are now the subject of tagging studies being conducted by a collaboration of USGS, Mass Div. of Fisheries and Wildlife and the University of Massachusetts. So far, the studies indicate that part of Red Brook’s trout population makes use of Buttermilk Bay during the fall and winter months, and may even move out to the Cape Cod Canal and Buzzards Bay. The above is an excerpt from "The Salter"..a newsletter of the Sea-Run Brook Trout Coalition. It's fall publication is now available. You can get the full publication by e-mail, you just need to visit the site for details. 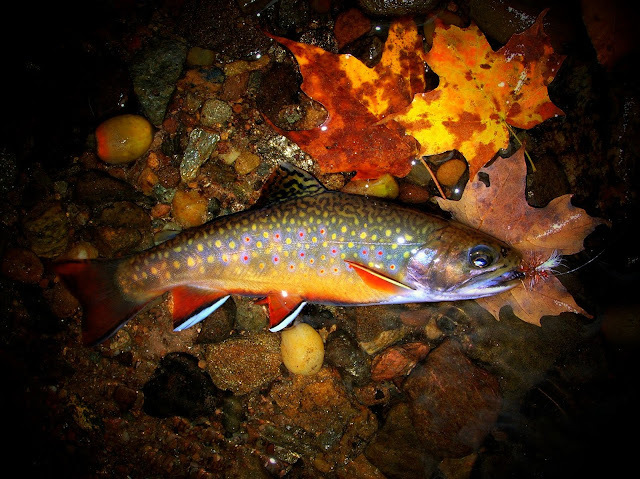 The newsletter is a great read with lots of information about sea-run brook trout. The link is below this post. Check it out folks. Reasons to be giving thanks for me are many and I will not list them for this is a blog post and not a book. This day before Thanksgiving was spent walking along a little brook. I was armed with a dry fly, a dry fly I fished the entire outing. 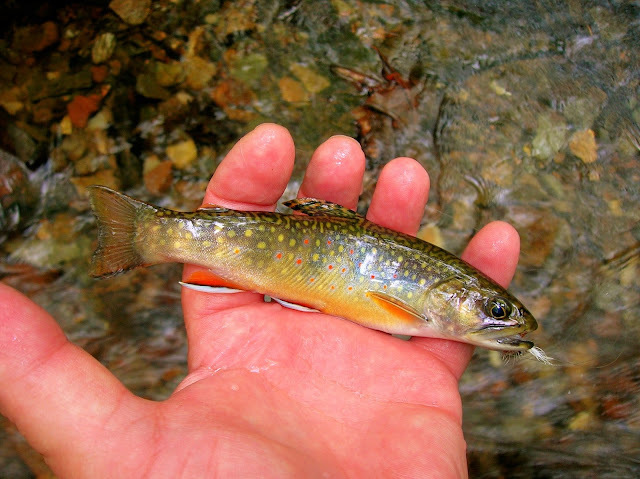 The quarry was wild brook trout those precious jewels of New England. They were very much in a pleasing mood for they harassed the caddis to no end. I wish to take this opportunity to wish all of you a very Happy Thanksgiving. An upstream view. There were beaver dams and a pretty big swamp. The stream sort of split at one point and we may have taken the wrong side. This stream is to beautiful to be lacking trout. More time is necessary to really find out just where they are. On my way home I decided to stop at a stream. I do not like the smell of skunk so I pulled out "Pinkie" and drifted it. It was a while but "Pinkie" came through. As I set the brook trout back into the stream a nice feeling came over me. A few of my favorite things.....rock walls, hemlocks, riffles, and brook trout. I found all of these on a recent outing to a small stream that was full of bright clean cold water. This day was to be such that I could do no wrong. The flies were hitting the water and not the trees, and the brookies were hungry and willing to tear up a few of my offerings. A New England rock wall it is broken down in places but still maintains that rustic beauty that I love. Riffles, pools and runs....hemlocks standing like sentries. A Hares Ear soft hackle drifting through the current was to much for this awesome wild jewel to pass on. Tumbling and crashing. I have fished this section on every trip to this stream. The only thing yielded has been branches floating down in the current. This day it gave up five of its residents. A high floating stimulator was the ticket. Better days on the stream...I think not. Wow this is my third cup of coffee this morning and the webs are still hanging on. Hopefully I can still make an informative post. Several weeks ago I received an e-mail from a gentleman who represents a company you are all probably familiar with. The company is Abel Quality Products. He offered me a fly reel for free and would send it to me with no strings attached. He had noticed the popularity of Small Stream Reflections, thanks to all of you, and said the reel would go well with the theme of the blog. I received the reel in the mail the other day and was very impressed with it right out of the box. As you can see it's look is somewhat different from most fly reels, a look I find very appealing. The reel model is TR1, it has a black frame and gold spool with click and pawl drag. Both the frame and the spool are solid. The handle is wood, which I find very attractive. Its fit is precise and the finish superb. I do not know the weight of the reel but it feels good mounted to my 3wt glass rod. I placed a 3wt line on it and lawn cast the set-up, it was a awesome feel. Well the true test came yesterday when I took the reel for an on-stream test. This little reel passed with flying colors. I would like to thank Abel Reels and the gentleman who sent it to me. This is the second post on the salter brook trout and their streams in southeast Massachusetts and Cape Cod. This trip was taken in early November and in the period of 3 days we covered a lot of ground, saw some magnificent beauty both along the streams as well as in them. I was able to experience some of the finest brook trout fishing in New England in an area that is full of American history. Some of these streams are not to far from where the first settlers of the new world enjoyed the first Thanksgiving. While turkey may have been on the menu, I'll bet that a few salter brook trout were. I could probably do a post a week on this incredible fishing experience, but that would perhaps be a bore..so I'll give you a few days worth. Join me as I walk the trails, streams, deer paths of "salter country". Parts of these streams look like gauntlets of thorns, willows, and grasses, places where an angler could not fish. In these places there are deer runs and access is quite good. Casting can be achieved if one thinks it out before letting go. The brook trout in these streams are always hungry. Snow flakes, perhaps stars, one only needs to use their imagination. A Cape Cod wild jewel. This is why streamer patterns are so effective on these streams. These are herring fry, they are starting their migration back to the sea. We saw thousands of these 2-4 inch fish moving down this fish way. Those herring fry are why salter brook trout of this size are in these streams. This fellow was taken in tidewater and battled with the tenacity of our Pilgrim ancestors. I worked these streams for several days. I got scratched, ripped a shirt, soaked several pairs of shoes and socks and fell numerous times, all this to avoid wading in the streams. He was not the biggest fish I brought to hand, but the most beautiful. There are so many people and organizations I would like to thank for the work they have and continue to do to restore, protect, maintain and monitor these wonderful fish and the streams they call call home. Instead of doing that I'll direct you to an organization that can. The "Sea-Run Brook Trout Coalition".....there is a link at the bottom of this post. "I felt like a turkey sandwich"
Yesterday I had a craving for a turkey sandwich. It was a cold blustery day and it's November. I could have gone to a deli and purchased some sliced turkey breast and been done....oh no. I went to meat department and walked the case until I came to the section where fresh turkeys were featured and purchased a half turkey breast. At home I boned out the breast and set it aside. We always have some form of bread that has seen fresher days so I broke it up, placed it in a bowl, added some cooked onion, celery and seasonings, and added some broth to moisten and into the breast it went. Into a preheated 350 oven and a hour and a half out it came. Put it on a board sliced it and the best turkey sandwich was had. There are some leftovers and they will go into another type of turkey sandwich. Turkey, stuffing, gravy, placed on hearty white bread, served hot. Just some stuff...and a farewell. In the Sept/Oct issue of Connecticut Wildlife there is a wonderful article about "fallfish". I have caught my share of these silver bullets while pursuing small stream trout. The article tells in detail the qualities of this fish and how it and confused with a couple of it's look a likes. It has very fine eating qualities having white firm flesh and has been referred to as a "miniture salmon". I would also add they will take your flies, wets, dries, streamers, and put a bend in you rod with gusto. There are always informative articles on the fish of Connecticut in every issue..well worth the price. A New Years Day tradition with a few of us has been to meet at a small stream and fish on the first day of the new year. There has been deer chili, chicken soup, sausage and peppers, donuts, coffee, and even some fishing. It's nice to get on the board the first day of the year. Well gents it's getting close. Maybe we can start thinking about a location for New Years Day 2016. Another loss. "Howie" rest in peace friend. November days, one such day was yesterday. It was bleak with rain in the forecast. I chose to fish a stream that was close to home and did not know what I was going to find. The summer as well as early fall was lacking rainfall and some of the streams have suffered. After gearing up I walked to the stream and found it flowing like early spring. Lots of water. The fly in the batters box was a winged wet, it was there from my last outing. I tossed it out and after many casts I did not take a strike. I moved upstream fishing and enjoying the sights of the woods, and the wind blowing through the leafless trees. I changed flies, the bomber was called to duty. No love for that fly either. A look into the box and another wet fly was selected, a yellow mallard wing, and a gray body. On the third cast I had a strike and a brookie came to hand. I fished the stream to the old washed out dam, which is quite a walk. All along I continued to take hits, and a few more to hand. A light rain started to fall, and a chill was felt. In this area where the large clump of instream wood had collected creating a bend in the streams flow and a perfect ambush point for a trout. The little yellow fly drifted just about to the end and a sudden swift strike took place...no hookup. I fished that fly several more times running it through everywhere I thought that fish was. I changed flies twice but the trout was put down. The rain continued lightly as I moved upstream. I knew my time was limited but until I felt the rain working through my jacket I was going to fish. Upstream proved to be slow and I said to myself it's time to head back. Before leaving I gave that wood clog another shot. I tied on a Royal Coachman streamer. Into the water it went, and the strike was fast and effective. A brook trout was on. Soon the fish was at hand. I don't know if it was the fish I had missed earlier, but it was indeed a fine wild trout. Friday morning I did a post on Red Brook. During the day I checked back like I usually do to reply to comments. I also checked my e-mail and saw one from "Fox News Channel"..I opened it and it was a request from a producer for the show "The Five" which airs live every week night at 5pm. The request was for permission to use the photos of the Red Brook feature on The Five. It seems that Tucker Carlson one of the hosts on the show is a reader of "Small Stream Reflections" and wanted to feature it on his portion of "One More Thing". Well I responded and gave the OK. I watched the segment feature and was so pleased. I can also say that there were many more who felt the same. Since Friday night at 6:05 the post that was featured on Red Brook has seen 15,000 page views. That my friends is very humbling. I wish to thank Tucker Carlson, Mina Pertesis, and the Fox News Channel. If you missed the feature then you can read about it here. Did I ever tell you about the brook trout streams of southeast Massachusetts and Cape Cod, perhaps in a post or twenty. We returned from a few days of fishing for some of New England's most special natives. They are the sea-run or "salter" brook trout that inhabit several of the coastal streams in the area. And I wish to tell you of some of the pleasure we found in being able to fish for these brook trout. The weather could not have been better for the first week of November. We were blessed with sunny skies mild temperatures and a touch of color that seemed to be hanging on. As usual we found some trout willing to take a streamer and a few special moments were caught of salter brook trout actually spawning. Both Jeanette and I agreed it was the highlight of our trip. I know it looks tight but actually it was not bad and I could present the fly pretty easily. I tangled with some incredibly strong brook trout. These fish were smart in their habitat and used it to avoid capture. I was graced by a few to hand. My type of path....soft pine needles a a bit of sand. Easy walking in beautiful surroundings. We found a deer trail through some thick woods that led us to some very productive water. This wild jewel along with three others were taken from a ten yard stretch of stream. "Take a break"....there is no better place. More on this adventure in my next post. The master, Fran Betters. Look at those materials..whats he tying? Anyone who has read the posts on this blog, and various fly fishing forums knows my love for a fly known as "The Bomber". The fly is a creation of Fran Betters of Wilmington N.Y. I think the "Bomber" was created around 1964 I base this on the fact that Fran also created the Ausable Wulff in 1964, and the both flies are similar in that they use the same materials just tied differently. 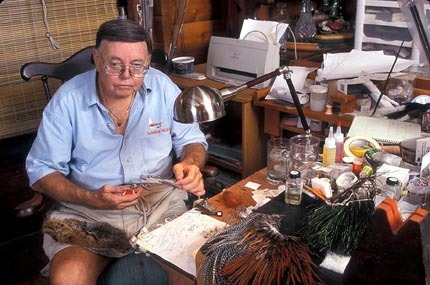 Fran was a master fly tyer but I don't think he knew just what a "GREAT" wild trout fly the Bomber was to become. I know I've said this before, and most who have fished this fly would also agree it is the "Best" wild trout dry fly. I have taken trout on the Bomber in every month of the year. On day's when nothing else is working out comes the Bomber and "fish on". I gave myself a challenge...the next time out I will only carry and fish the "Bomber". "Ausable Bombers"......the fly in the center is my tie, and the two that flank it are Frans. I'm looking forward to this challenge. A couple of "Bomber" results.